I used 12 tabs on one bracelet and 13 on the next one to make it a bit larger. I also added a leaf to the one stitch on the top bracelet. The original pattern calls for 12-14 tabs. Just check the fit of your bracelet as outlined in the video for the correct number needed for your project. Very neat .. I have only 9 tabs, otherwise I would make one for myself right now! Also .. how do you get the piece that holds the tab to the soda can off? do you cut it off? Mine usually pop off without breaking that small piece in the bottom hole of the tab. You need just a few more to make your pop tab bracelet. Using 12 was a good fit for me but 13 is normal too. It just depends on the yarn you use too. As far as the little metal tab, I usually just bend it off and it breaks off easily. If it doesn’t you could use a pliers to break it off and then smooth the edge if necessary with the pliers. I have seen belts like this for sale at a flea market. Any idea what they used for buckles? or how many tabs you would need? 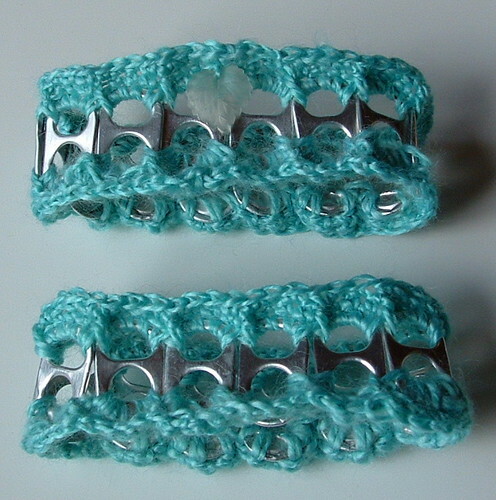 Barbara- I’m not sure how many soda tabs a belt would take. It would depend on the style and size. I sent you an email with some links with pictures. One belt did say it would take about 120 tabs but it’s really hard to know for sure. 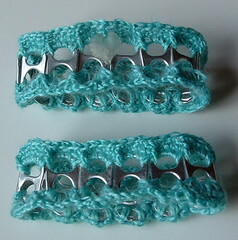 Let me know if you make a belt as I’d love to see your project.